Here are some quick and easy ways to mix up spices and fruits to make a delightful simmering potpourri! Nothing welcomes guests into your home during the holiday season like warm, delicious scents. 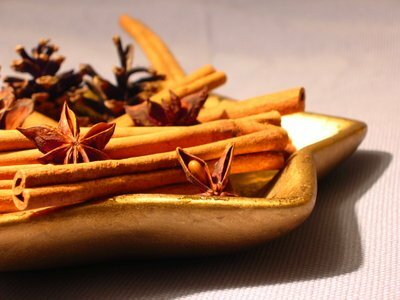 You won't have to whip up a festive pie each day to achieve this heavenly smell - take the easy and inexpensive route and make a stovetop potpourri using fruits and spices of the season. The key ingredients for great fall and winter smells are citrus fruits, like lemons and oranges, and cinnamon. When using cinnamon sticks, be sure to break the sticks in half so that it breaks down faster and you can get the most scent out of the stick. When cooking, most of these potpourri recipes are designed to simmer for 2-4 hours, so you will need to add more water if you want it to last longer. You can also give stovetop potpourri as a cute gift by putting all of the ingredients in a small bag and adding ribbon and a tag. Also, if you want to make your home smell nice without having to worry about the stove being on, try one of the dry potpourri recipes at the bottom! Directions: Mix all ingredients together in a pot and bring to a boil, then reduce heat to a low simmer. Keep an eye on it while it simmers, and add more apple cider as needed. Directions: Pour water into a small saucepan, covering about 1 inch below the rim. Add all of the ingredients, put on the stove, and simmer on low. Directions: To dry orange slices, blot away extra juice with a paper towel, then put slices in the oven on a cookie sheet and bake for 3 hours at 280 degrees Fahrenheit, checking on them often to make sure they do not burn. After it cools, mix all ingredients together in a decorative bowl or dish. Peak of Flu Season, Get Your Flu Shot! Subject: LongIsland.com - Your Name sent you Article details of "Scents of the Season: Ways to Fill Your Home with the Aromas of the Holidays"